It’s the opening night of Berlin Atonal and I’m riding the U-Bahn. A pair of weathered violinists perform Aqua’s timeless classic “Barbie Girl” to a carriage of captive commuters, which gets me thinking about the avant-garde and Berlin. For a city so often associated with the cutting edge, it’s ironic that much of Berlin’s electronic music scene is powered by deeply ingrained strains of musical conservatism. So when a festival like Atonal comes along courting an “experimental and uncompromising spirit”, you’ve got to wonder how far they’re going to go and what they think those terms entail. Scanning the four-day program it seemed that dark droning techno variants, tempered with a smattering of British industrial clang and a dash of continental avant-gardisms, constitutes experimental in 2014. 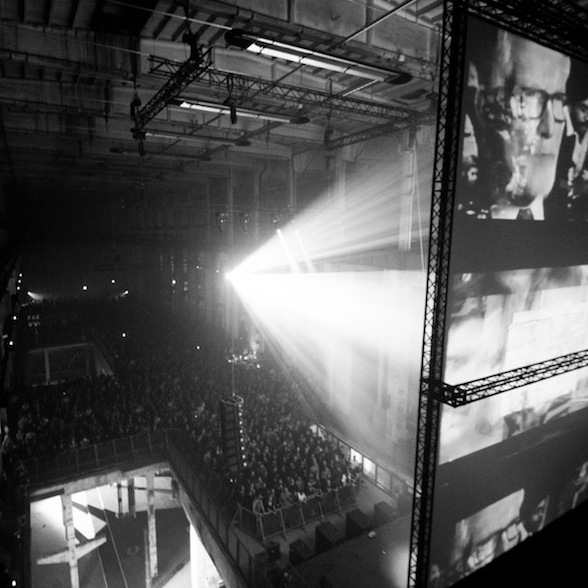 Whether you agree is up to you, but last week Berlin Atonal had the floor. The opening night featured performances of two Steve Reich pieces, namely the ubiquitous Drumming and Music for 18 Musicians. I was wondering what new light could be shed on Reich’s ossified yet doggedly relevant compositions. Atonal’s trump card took care of that; the gargantuan Kraftwerk power plant does things to music you can’t experience anywhere else. To put it into rough perspective you could probably fit a cargo ship in there, or maybe ten Berghains. It was the unavoidable narrative of the week. You couldn’t talk about the music without the space dominating the conversation, such was the extent that it colored the experience. The building’s decades-long reverb made for a volatile atmosphere of psychoacoustic microclimates. Different angles of auditory perception were on offer to those willing to wander. Younger attendees lay stretched out on the floor pondering the yawning space above, while festival volunteers were beset by older visitors complaining about the lack of seating, (a couple of days later one savvy patron took the festival by storm, erecting a hammock between two pillars and floating in luxury). Meanwhile, the percussive attack of Drumming was dulled into an oozing system of percolating clouds that searched out the building’s far flung extremities. The Reich pieces worked where others failed in that they allowed the echo of the power plant to dominate the music, rather than trying to overpower it with brute force. To make the space speak the conversation had to run both ways. Thursday marked an early high point of the festival with Sendai getting the Kraftwerk singing in ways no one else quite matched. Peter Van Hoesen and Yves de May have some pretty serious techno pedigree and they didn’t spend more than a minute messing around sans bass. As he’s mentioned in the past, Van Hoesen isn’t a big fan of elaborate lighting so the duo performed in near darkness for the duration of their set. Imagine atoms of Sandwell District and Raster Noton colliding and fusing in a power station and you’ll get some idea of the sounds on offer. Some of their finest moments came in the middle of their set as they shifted into odd metric territory. Getting away from 4/4 allowed their brilliant sound design new spaces to shimmer and burn. It made me think what a shame it is that Westerners turn to stone as soon as someone beats out some unquantised 13/8. Asian, African and Middle Eastern cultures have been dancing to irregular pulses since music documentation began, yet veering away from rhythmic consistency remains a risky tactic for us funkless Westerners, even in musically openminded contexts like Atonal. Following on from Sendai, I was pretty hyped to see what Milton Bradley had in store for his live A/V set. Billed as The End Of All Existence, Bradley was accompanied by a screen that panned slowly through black and white images of post-apocalyptic urban dreadscapes, reminding us how static the network of visual associations orbiting techno has been over the past twenty-five-odd years. At this point in time getting something fresh out of such a juxtaposition is a bit like drawing blood from a stone. In contrast, Abdulla Rashim’s A/V performance on Friday was daringly subtle. Rashim was one of the only artists to use bass sparingly, allowing the intricacies of his precisely layered mid-range to blur into the hall’s dubby ambience. When the bass eventually reared its ignoble head I’d forgotten it was even gone, so the effect was fresh and potent. Rashim gestures toward possibilities still untouched in techno as we know it, raising the idea that there’s still more to hear in this well worn sound. Having said that, after watching Donato Dozzy and Nuel take the stage in Rashim’s wake, it was evident how little has changed in ambient techno in the six years since their Aquaplano project laid the blueprint. Their three dimensional style inspired a subsect of horizontally minded producers who adopted their template without advancing much past the initial mission statement, mainly because most imitators lacked the animate emotional core that made the Aquaplano material so resonant. Their set was liquid and underpinned by a real sonic force that filled the cavities of the power plant with a throbbing aural weight, as if the air had gained mass and density. By this stage of the festival it was clear that one of the underlying tensions facing these artists is how to reconcile textural stasis with rhythmic movement. We’d either hear slowly evolving drones or be thrown headlong into propulsive forward movement, with not a lot in between. Dozzy and Nuel managed to navigate through this binary, finding that sweet middle ground where timbre, harmony and rhythm blend into a musical unity. The main event for Saturday was Richard H. Kirk performing as Cabaret Voltaire. Billed as a “no nostalgia” set, the most immediately confronting aspect of Kirk’s music was its sheer volume. His vocal cut-ups rang out of the system to wreak havoc on your cochlea, while the triple-screened visual accompaniment layered VHS footage of various low points in human history. Kirk’s set sounded right at home in the Kraftwerk—his connection to the spirit of the original Atonal was particularly poignant as he blasted past the furrowed-brow meanderings of ambient techno, making it sound positively dainty in comparison. His set was a militaristic pastiche of genre detritus, performed with a gleeful and wilful disregard of the conventions which kept other festival artists from really exploding. Kirk used sudden stuttering silence in an effective way which revealed the true extent of the room’s reverb; those moments of jarring stillness revealed the thick ambience constantly hanging in the space. Kirk’s set begged the question: what will he do with this music? Is it being released in the form we heard at Atonal? Of course the ball is in his court, but judging from the size of the crowd there’s probably at least a hundred labels that would kill to put it out right now. Maybe the experience was greater for being a one-off, but there was an air of importance around this work that felt vital. The sense of freedom his music exuded threw the conservatism of much experimental music into stark relief. I’m not sure how he felt, but if I were Fis standing in the wings waiting to follow up Mr Kirk I would be freaking. Last time I saw Oliver Peryman play the promoter asked him to change the music during his set; now, less than a year later, he is following up the triumphant re-emergence of a veteran at a major festival. It’s great to see him be plucked to close out events of this type so early on in his career, especially after being initially misinterpreted as a drum’n’bass producer. His set featured the nuanced dynamics and crushing claustrophobia of his best work and marked him out as an artist to watch. While the sound in Kraftwerk was akin to thunder and lightning, the afterhours events downstairs in Tresor came across like a brick in the face. A constant flow of people stumbled in to see sets from the likes of Powell and Sigha, but many squeezed straight back out after five seconds of constant smoke, high speed strobing and a bludgeoning mid range. It’s a context determined to singe off your nerve endings and turn you into a hollow straw shell. A similarly malignant atmosphere came to the power plant on Sunday, especially during the debut appearance of UF, a new collaboration between Samuel Kerridge and Oake. Needless to say, it was a match made in hell. Visualise a gigantic Victorian-era steam engine blasting out of the industrial epoch to crush our shiny, torpid future—hulking rotors, churning gears, rusted steel, all delivered with a live visceral energy that set their performance apart from some of their more reserved contemporaries. More predictable but no less satisfying was Tim Hecker. He’s played about a billion of these festival slots, and his powers haven’t shown any sign of diminishing for the past few years now. To read more Berlin Atonal content, including an interview with founder Dimitri Hegemann, go here.